Anonymous Hackers send a video message to Westboro Baptist Church ! Anonymous doesn't kid around and the Westboro Baptist Church learned that the hard way. 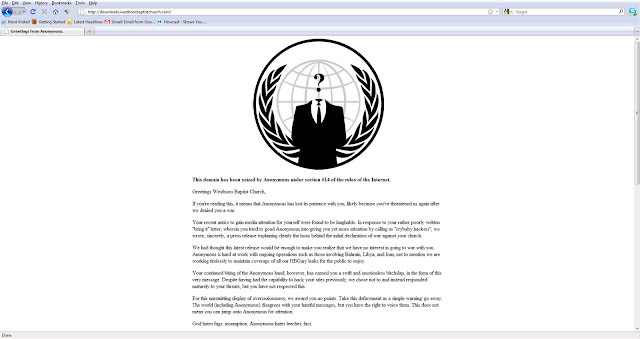 The hacktivist group took down their website and left a stern message. The two groups, the radical hackers which launch denial-of-service attacks and the radical religious organization which preaches its message about God by protesting military funerals, have been sparring through the Internet and online message boards. The feud began with a "letter" from Anonymous to Westboro Baptist Church, explaining if the church didn't stop their "benighted gospel of hatred" and "fascist views," Anonymous would target their websites. Then WBC responded to the letter telling Anonymous to "bring it." Anonymous followed that by explaining the initial letter was a trap set up by "attention whoring idiots." WBC took exception to that and said in reality, Anonymous had attempted, and failed, to hack their sites. WBC spokesperson Margie Phelps said the second message by Anonymous was an attempt to cover up their failures. It appears there is no need to cover up anymore. That's because Anonymous has successfully hacked into Westboro's group of sites, including the main one, www.Godhatesfags.com. Over the past day, the websites have been down completely. Before the sites went down, Anonymous left a message for Westboro Baptist. When launched, instead of the regular www.Godhatesfags.com site, there was a letter from Anonymous. At the top the letter said, "This domain has been seized by Anonymous under section #14 of the rules of the Internet." In the letter, Anonymous explained they had no interest in hacking into Westboro's sites, but WBC's continued with its "biting of the Anonymous hand," which ultimately forced a response. At the bottom of the letter it said, "God hates fags: assumption. Anonymous hates leeches: fact." An Anonymous hacker named Jester took credit for the attack and message. During an interview on the syndicated David Pakman radio show, a spokesperson from Anonymous confronted WBC spokesperson Shirley Phelps-Roper and told her the sites had been hacked.